The success of your promotional campaign is largely dependent on the quality of product images that you use for attracting prospects. To add commercial value to images, they have to be professionally retouched to ensure that their resolution is optimum and excellent quality prints can be taken. 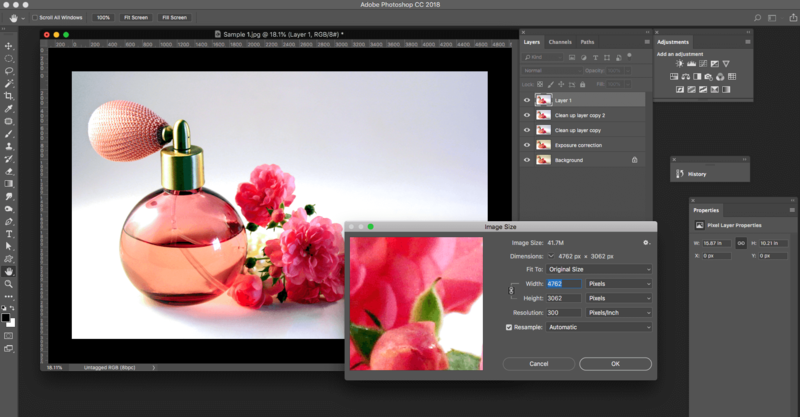 Adode Photoshop is the industry standard software for retouching images. By leveraging the tools and techniques used by professional artists, you too can pull off similar effects on images captured by you. Over here, the proven ways to retouch your product shots in Photoshop would be discussed to help you carry out the same with ease. An example of a glass product is taken to understand ways to retouch images that pose challenges. Lighting and photographing glass products are a tough task. This is because incident light gets reflected and refracted from the surface in unmanageable proportions which present difficulty in retouching. 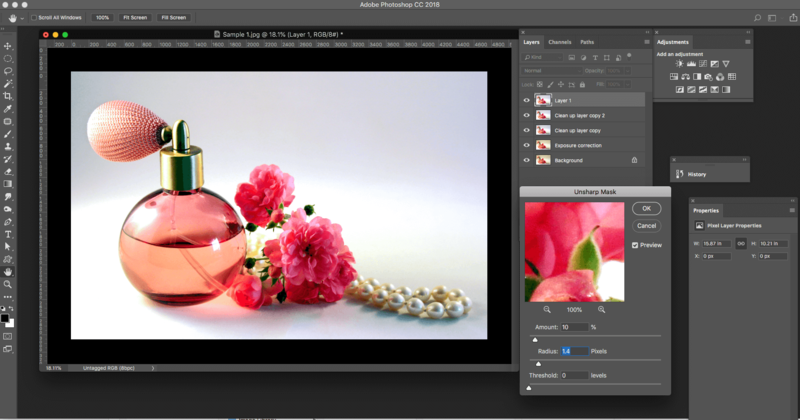 Photoshop, however, offers the tools needed for adjusting, correcting, improving and enhancing the images convincingly. The lighting exposure can be improved and specks, as well as color casts, can be eliminated for achieving impeccable results. 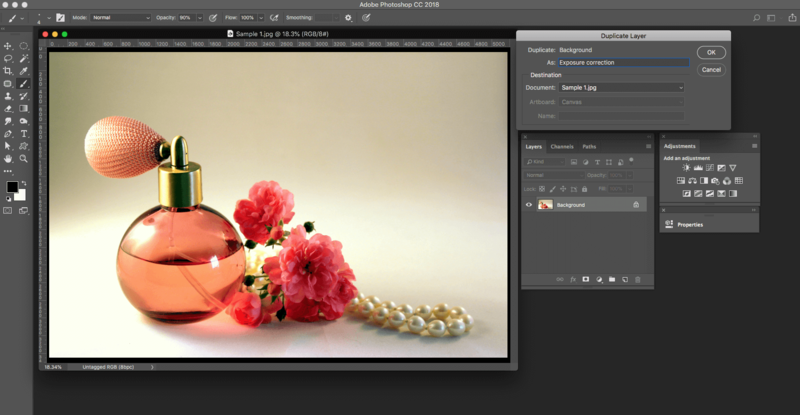 Let’s now understand the steps through which Photoshop allows us to retouch the images for immaculate outcomes. 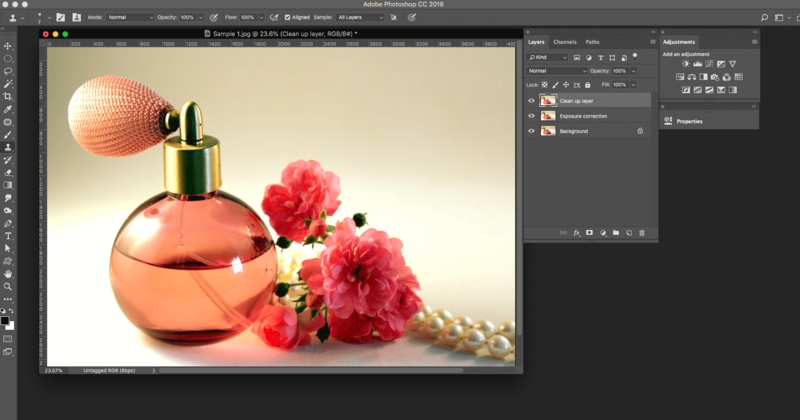 We hope this step by step tutorial explained the processes for cleaning up and retouching the images of products to match professional requirements. 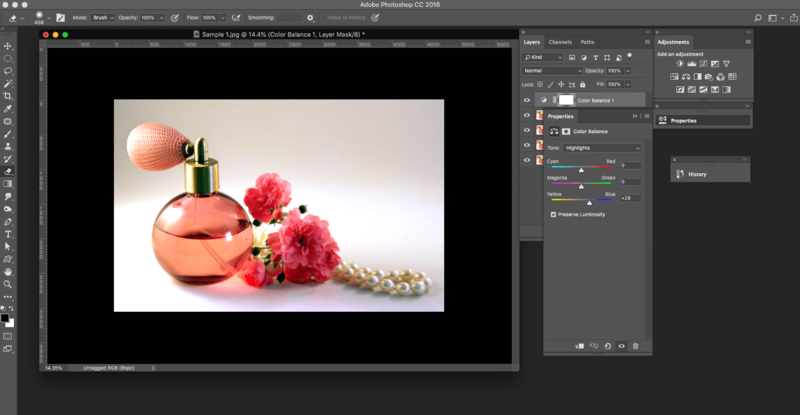 Photo retouching is an important step for creating compelling products portfolios. It involves light adjustments, managing gear, pre-production processes and much more. You cannot limit image production to shooting a photograph of the model donning the apparel or displaying a product; this is merely a basic step. There are plenty of important steps to follow including the most important photo editing process that can eventually provide the perfect image. For high image quality, all the imperfections and distractions in the photograph should be eliminated. With proper techniques for processing product photos with Photoshop, you can exclude all such flaws to come up with attractive and flawless images. 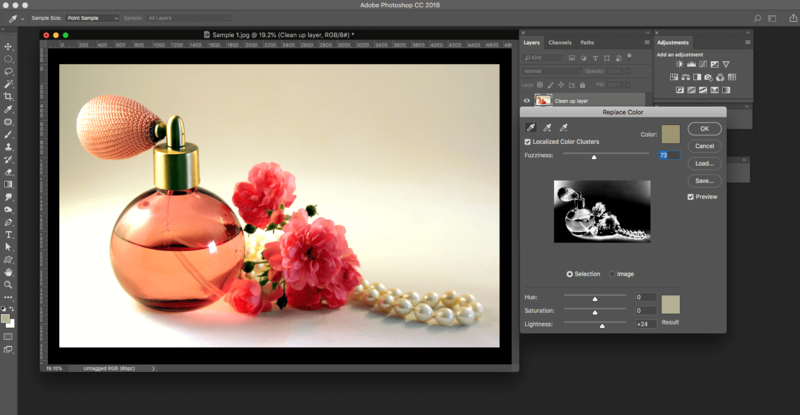 Find out how the application of photo retouching can improve the presentation of your images. While garment sales are multiplying online, you need to improve its presentation through advanced retouching techniques. You can shoot the garment flat, don it on a mannequin or suspend it on a hanger and shoot it. If you consider the images used by e-commerce stores, then you can understand that most of them are choosing to don their apparel on a mannequin or on models. This helps the potential buyers understand the fitting and style of the garments. They can easily imagine how the garment looks on them while wearing it. So, you have to present these modeled apparel with high-quality photos. Simply shooting a photograph in the studio cannot provide you with a high-quality image, but applying photo editing techniques can. You can apply retouching techniques and improve its presentation. You want that branded shirt to look crisp, immaculate and spread over the bold shoulders in the perfect fit. But you are not sure how to attain the perfect fit. With photo post-processing, you can present your shirt perfectly and capture the attention of the potential buyers. This can help you to sell your products quickly. You can change the shape of the hemlines for jeans, reduce flared handcuffs of shirts, remove wrinkles at the armpits and apply plenty of retouching techniques that are even most effective on the garments. It is even possible to remove the shadows that appear in the images. A silhouette of the garment is created and the garment is retouched to fit in the shape. 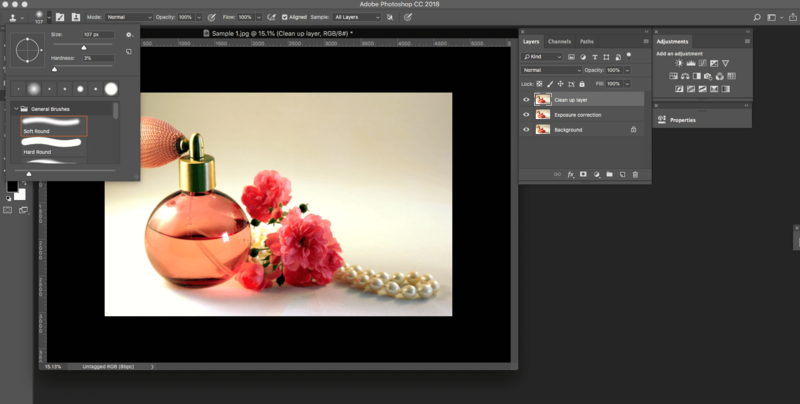 You can actually watch the difference of the images after the application of retouching. However, in the enthusiasm to retouch images, do not remove the original features of the products; instead focus on the flaws and gain perfection of the product in the images. Your mannequin may not be designed in exact size for the garments. Then the stylist needs to pin the garment to alter the fit. 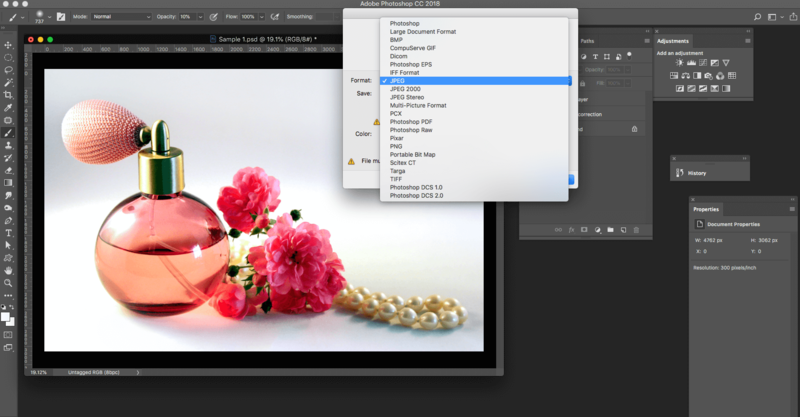 With good photo touch-up, you can remove the distractions and produce a flawless high-quality image. There is a great application for editing if you are shooting photographs of shoes. Leather crinkles easily on the use and the images will need retouching. You can easily moderate the shine on the shoes, remove crinkles and transform your photo easily using the retouching techniques. You can use the techniques for all footwear and present your photos fresh and perfect. Tidy your footwear easily in the images! 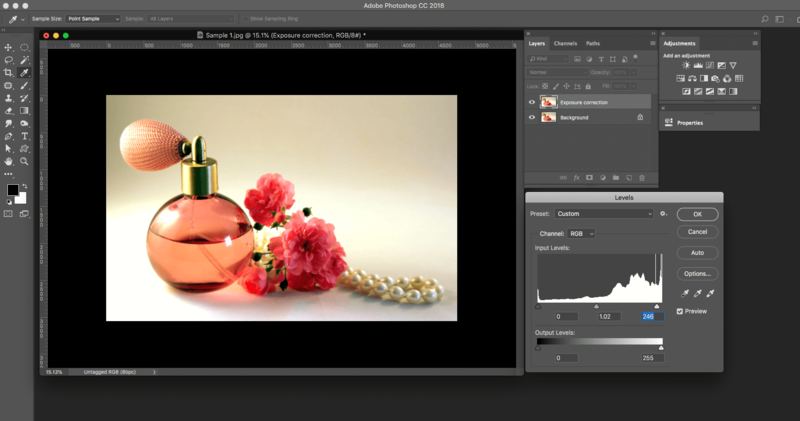 The medium photo-editing process focuses on improving the image of the products while implementing cleanup or focusing on the shape of the products. Using these retouching techniques, you can even remove the crease on the apparel clad by the mannequin. Another important application is to enhance the shape. Remember to focus on the shape of the apparel. Ensure that no signs show up any traces of misfit. You can use retouching techniques and smoothen the fit of the apparel and avoid bumps or other imperfections that can indicate the sign of misfit. There is no better way to improve the presentation of your product. Heavy retouching involves offering image detailing to improve the perfection of the image. You can follow the medium retouching process but add additional retouching. At PGBS, we use silhouettes for providing good shape. 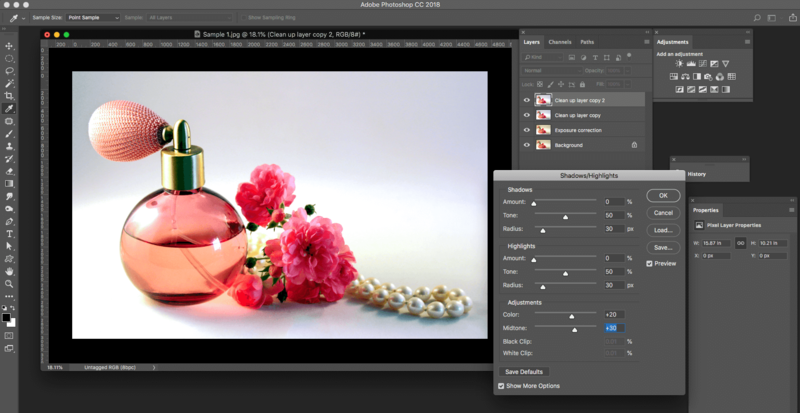 With the application of heavy retouching, your product image should improve and exude perfection. It shouldn’t look fake and confuse your customer. This can breach the conviction of your customers and they may not trust your products anymore. This is most likely to happen in e-commerce stores while many of these stores are opting to apply heavy retouching on their products. You can offer perfect, retouched images of products and impress your customers. But do not overuse the techniques; instead, provide some natural effects just like professional commercial photo studios do. So, while planning to offer images for e-commerce stores, ensure that you provide realistic images than chase off their customers! Maintaining a realistic feel is the very basic of ensuring effective e-commerce photo editing services. Mostly heavy retouching is used to remove creases on products such as shirts and jackets. You can also reduce the shadows caused by creases using the heavy retouching technique. It can also be used to remove imprints. You may have to remove all undesirable imprints on the garments especially while you are presenting an image. In many images, the outline of the mannequin, inner garments, pockets are all showing up and causing a distraction to the buyers. With the heavy retouching application, it is possible to remove these distractions and offer an immaculate image to the clients. You can also use heavy retouching to offer the standard shapes to the sleeve cuffs, trouser cuffs, waistbands etc. Symmetry is considered a beauty while appreciating products. Customers are scrupulous about symmetry while considering the purchase of apparel and other products. They easily refuse a product that lacks symmetry. They are not to be blamed; no one can wear a pant or shirt that is asymmetrical and appear in the public. 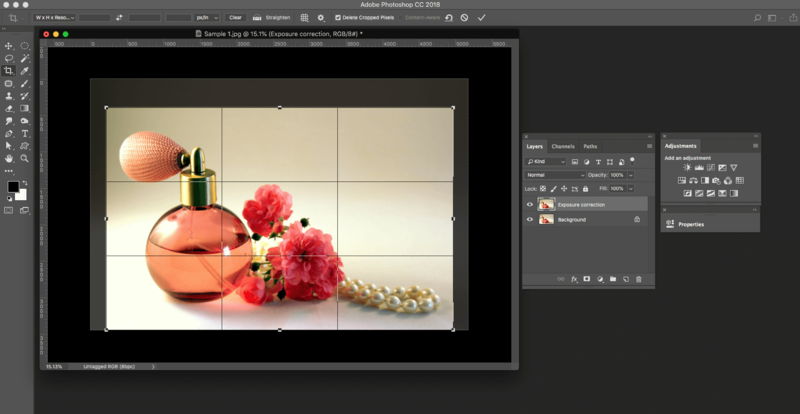 Now you can apply the needed product retouching tips and techniques to assign symmetry for all your apparel such as shirts, jackets or pants and display the perfect images. Choose any level of retouching and ensure symmetry for all your products. Donning your apparel on a mannequin is a great way to present your apparel without any flaws. Merge two or more photographs and turn the mannequin invisible. Thus, you will be able to showcase your products with the shape of the mannequin. This photo editing technique is most useful while presenting products in e-commerce store or for other online stores and websites. You can easily present your products with good shape and evoke the interests of the customers. You may have assumed that models are ethereal beauties after looking at their images in the glossy magazines and ad banners. Simply as you are not aware of the expert retouching techniques at backhand used to cover the baggy eyes, uneven complexions, ugly moles and other flaws. Good photo editing techniques are the secrets to flawless model images. Sometimes businesses are eager to highlight their products than present the beautiful faces of their models. So, while editing, the faces of the models are cropped and the products such as apparel are highlighted and zoomed. Thus, they avoid the distraction of the beautiful faces. This technique is a shrewd one… Try it. E-commerce stores are extensively using cropping while displaying their latest apparel online. Many models consider cropping positive, so there are no legal battles. But of course, you cannot overuse the images as you wish. While the faces of the models are cropped, you do not have to plan to retouch elaborately on the face. You need not apply to retouch and remove eye bags, skin blemishes, and clear complexion or apply the techniques tediously. Instead, you can forego the efforts and save your time. You need to opt between the two effective skin retouching options depending on your requirements. Natural retouching is used for outdoors shots and other practical shots where you do not want the model to appear with loud make-up. While endorsing cosmetics, the retouching techniques used are different; the natural retouching technique is subtle and is used for a specific purpose. It focuses on techniques such as removal of tan etc. Even skin tone is a beauty in itself; you can perfect the skin tone of the model and ensure that there is even skin tone throughout the body. You can plan tan removal using expert retouching techniques and provide an attractive photo. Remove all kinds of marks and blemishes on the skin such as bruises, acne, pigmentation, warts or moles to clean your image and present it perfectly. Some experts do not interfere with the permanent scars or birthmarks as they show up in other modeling shots. Classic retouching removes blemishes and smoothens the skin. It smoothens out the skin of the model that evening the skin tone. But distractions such as freckles and noticeable moles are removed. In-house team our offshore destinations? The two options when it comes to photo editing are to opt for hired retouching professionals or outsource the tasks to other professionals. The first option of hiring skilled permanent or freelance retouchers is expensive. But if you are establishing a full-time venture for retouching, then hiring expert professionals can be feasible especially if you have plenty of services to complete. Outsourcing retouching requirements are affordable and the cost is much lesser. You can seek assistance from our professional retouching company and benefit from the specialized retouching services offered. Retouching is an important application in the retail industry while ad images need to be created and presented to a multitude of customers. There is a marked difference between the images of the products with and without retouching. You can spot the wide differences yourself; understand the perfection and quality of the retouched images. Your brands can easily benefit from photo editing techniques. Using the best techniques, you can dynamically improve the presentation of your brands and kill competition. If your brands are highlighted through excellent images, clients will notice your products and prefer them over others. Photo editing techniques are already effective in improving retail sales and marketing. As e-commerce stores are extensively applying these techniques, their products are marketed easily. So, plan to increase the image quality of your products and win over potential customers. You can introduce your products to new customers more effectively by presenting them the images that have been retouched. Get ahead of other brands in the market! Well! If you need expert assistance, PGBS is the name you can trust.